This brake kit is used in place of your barrel nut-very nifty accessory for your Dan Wesson! I have found the most effective design seems to be 2 rows of holes/ports oriented somewhat vertically. The trick is getting the ports timed correctly-this kit takes care of that by the use of precision shims for custom installation on your pistol! Please note the brake is "fairly" simple to install-it takes a little bit of time and patience to get the ports aligned perfectly. Instructions included. 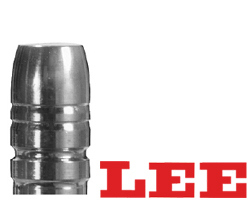 For all large frame calibers up to and including the .45's. No frame/shroud/barrel/sight included-used for demo purposes only. if your hunting thicker brush, a great deal of Florida is like that,and it makes it a real challenge to get close to deer/hogs . most of my friends cut a couple shooting lanes like spokes from a wheel hub about 50-80 yards long from a low tree stand they build or use the power line right of ways,and the game soon use those as travel routes and we soon found that a 44 mag revolver,445 DAN WESSON SUPER MAG, or carbine IN A CALIBER LIKE 450 marlin,444 marlin,45/70 govt,or a similar firearm, seems to be ideal, as a shot over 40 yards is very rare, in that stuff,and theres nothing Ive found yet that even a 44 mag loaded with a 300 grain hard cast lee bullet over 20 grains of H110 won,t stop and Ive shot some fairly large hogs in that crap. now Im sure that someones going to point out a 500 S&W, or 460 S&W has more power, but honestly if the 44 mag zips thru , and leave a large hole now,whats extra power going to accomplish. 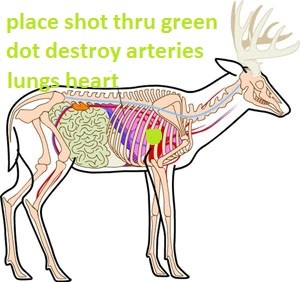 if you can find a location where two larger thick areas narrow to a thinner neck and place a tree stand and run the shooting lanes out so as to form an easy path thru the thicker areas to two adjacent thinner areas you will almost always provide a preferred route for the deer to use, and over time a deer hot spot for hunting, the thinner areas don,t necessarily need to be real large,or similar a field near a lake shore, that's separated bye a wooded strip, or a strip of high ground thru a swamp,are examples, but it helps to research the deer bedding and feeding areas, before selecting a site. and obviously you don,t want it in an area of high human traffic or easy hunter access from near-bye roads, edges of power line right of ways and agricultural field corners ,or edges of ponds or lakes that border on wood lots or currently un-used fields frequently can provide the locations, and where legal on private land a mineral block placed near bye, won,t hurt. 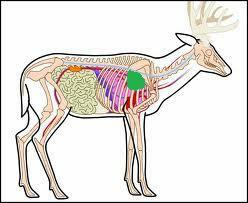 keep in mind most deer with functioning brain cells avoid crossing truly open ground during day light, during the hunting seasons, and tend to stay just inside the brush on field edges when they can until dusk. Im a bit curious, after a recent discussion, I was just out hog hunting with a buddy here in florida , on a guys ranch, he was very impressed with how well my 445 dan wesson super mag had put down some hogs. the thing I found rather ODD was he had never even HEARD of a 445 dan wesson super mag, now ,if you have yet to see or try one, its similar to s stretched 44 mag with a 1.6" long case and generally throws bullets of similar weight 200-300fps faster than a 44 mag. bullets performance is dependent on a good knowledge of the games anatomy and very precise ,and correct shot placement. the load I use is a 300 grain hard cast gas check bullet, with a fed mag pistol primer and 30 grains of H110 which results in near 1480 fps in my 10" barrel revolver, this is a hot but certainly not max load ,at least in this revolver. The .357 SuperMag as chambered in the Dan Wesson heavy frame revolver of the same name or in the Ruger .357 Maximum Blackhawk or even in the Seville Silhouette Single Action, is generally regarded by many experienced silhouetters as the finest revolver cartridge for long range shooting ever conceived. The concept was a simple one. Instead of using a big bore for silhouettes, stretch the .357 Magnum enough that it would handle 180 and 200 grain bullets at normal .357 Magnum muzzle velocities. A length of 1.610" was selected and 180-200 grain bullets did indeed attain the same muzzle velocities as the .357 Magnum using 158 grain bullets. Though the concept was simple, carrying it out was not. It was more than a matter of chambering an existing revolver for the new cartridge as stretching the case to 1.610" also meant stretching revolver frames and cylinders a like amount. This is no simple task and certainly required a large investment in time, money, and engineering. When the .357 SuperMag from Dan Wesson first appeared on the scene, more than one wildcatter was waiting with reamers in hand to do one thing: Turn it into a true big bore. The largest number of these were turned into .44 SuperMags, and I had the privilege of doing extensive shooting of one such early wildcat, the .44 UltraMag. The .44 UltraMag used .444 Marlin brass cut to 1.600", and this brass being larger in diameter than .44 Magnum brass, was swaged and turned on a lathe until it matched .44 Magnum dimensions. The reason, of course, was to also allow the use of the shorter .44 Magnums in the same cylinder. All loads were assembled with WW680 powder and CCI #350 Magnum Large Pistol primers with the 305 grain cast bullet giving five-shot groups of 3/8"-1/2" at 25 yards. Barrels for the .44 UltraMag were standard Dan Wesson .44 Magnum barrels but because the SuperMag frames used different threads, eight-inch .44 Magnum barrels were cut to six-inches and rethreaded. Various .44 SuperMags, based on either .444 Marlin or .30-40 Krag brass, have surfaced since, but the ".44 Stretched Magnum" became a production sixgun in 1988. Dan Wesson and the late Elgin Gates of IHMSA, combined forces to create the.445 SuperMag. Dan Wesson supplied the guns, IHMSA supplied the brass and healthy orders for the new big bore sixgun. As of this writing, .445 SuperMags are available only from Dan Wesson in both blue and stainless steel versions. No other revolver manufacturer has seen fit to produce the .445 Supermag, so it is either Dan Wesson or a Thompson/Center Contender single-shot. Brass is available, but no factory loaded rounds. Brass can be acquired only from The Silhouette (phone 208-524-0880), and the latest run will be headstamped ".445 Gates" in memory of its creator. Problems surfaced early with the .445 SuperMag revolver and also with the .445 brass. The first guns had oversize cylinders and the brass was not properly annealed. Problems with sizing .445 SuperMag brass has also resulted whether using either .445 or .44 Magnum carbide sizing dies both of which often raise a sharp ring of metal right above the base of the fired shell. Standard non-carbide .44 Magnum sizing dies will give better results. 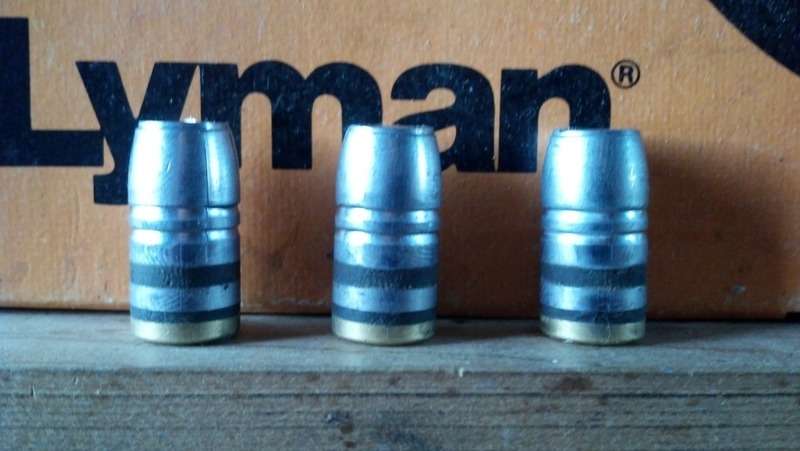 In my reloading of the .445, I use neither .445 nor .44 Magnum sizing dies but instead opt for a custom RCBS .44 Schafer UltraMag sizing die that puts a slight taper on the case from base to mouth, and is much easier on brass. It is somewhat of a nuisance to use as cases must be lubed and virtually hand fed into the very sharp, very flat base of the sizing die, but the results are well worth it. Most sizing dies have a slight funnel shape at the bottom to assist entrance of the case mouth; the .44 UltraMag die does not. Except for the case-sizing cautions, reloading the .44 SuperMag is the same as for reloading the .44 Magnum. A good heavy crimp is required both to keep bullets from moving forward in recoil as the big sixgun is fired, and also to get the powder started burning properly. Powder selection is a little different as I stay with H4227, WW296, H110, WW680, and AA#1680, staying away from any faster burning powders. The same bullets that work in the .44 Magnum also work well in the .44 SuperMag with my preference being for the heavier bullets in the 290 to 310 grain weight range. The .44 SuperMag is a an exceptionally accurate cartridge and this accuracy is even further enhanced by the use of heavyweight bullets such as the SSK J.D. Jones designed #310.429 flat point, the NEI #295.429 GC (available from BRP Bullets, 1210 Alexander Road, Dept. AH, Colorado Springs Colorado 80909) or Sierra's 300 grain jacketed flat point. Speer also has a 300 grain bullet in the works but I have not yet received any for testing as this is written. Large Rifle primers are usually recommended for the .445 UltraMag/SuperMag/Gates, but I have yet to determine a nickel's worth of difference between the use of Large Rifle Primers and Magnum Pistol Primers. Muzzle velocities and accuracy are both virtually identical whether Federal or CCI Large Rifle Primers, or Federal or CCI Magnum Pistol Primers are used. The .445 SuperMag has been touted as a silhouette revolver and it is IF properly loaded. It makes little sense to load it to the hilt and try to shoot 40, 60, or 80 targets with it. Even with the ten-inch barrelled version, which is just a shade under four pounds, recoil can be quite disconcerting with full house loads. For silhouetting, I would stay at 1650 feet per second or less with the 220 grain Sierra silhouette bullet or 1500 feet per second with the 240 Speer silhouette bullet. Using the 220 grain Sierra and 34.0 grains of H4227, muzzle velocity is 1648 feet per second according to the triple sky screens of my Oehler Model 35P chronograph. The same load in an eight-inch barrel goes 1635 fps, six-inch gives 1541 fps, and the Super Fourteen T/C Contender milks it for all it is worth and yields just barely over two thousand feet per second. With the 240 Speer silhouette bullet, I use either 33.0 grains of H110, 31.0 grains of H4227, or 38.0 grains of WW680 for the 1500 feet per second muzzle velocity range from the ten-inch barrelled Dan Wesson. These same loads will do 1350 to 1450 feet per second in the six-inch and eight-inch barreled DW's and right around 1850 in the Super Fourteen. The heavier weight bullets really make the .445 worthwhile and the replacing of the ten-inch standard barrel or eight-inch heavy barrel that were standard equipment with my early .445 Dan Wesson with a standard weight six-inch barrel makes the .445 handle as easily as a Smith & Wesson Model 29. Well, real close anyway. The shorter barrel transforms the big Dan Wesson from a clumsy, heavy competition pistol to a very packable hunting pistol. Hunting with the .445 SuperMag means heavyweight bullets such as the 265 grain Hornady Jacketed Flat Point, the 300 grain Sierra Jacketed Flat Point, or cast bullets such as NEI's 295 grain Keith style or SSK's 310 grain flat point. Using 31.0 grains of H110 with the latter three bullets in the 300 grain weight range yields impressive muzzle velocities with the six-inch barreled Dan Wesson. Even with this relatively short barrel length, the 300 grain cast bullets will go 1500 feet per second giving a lot of power from a small package, or the 300 grain Sierra Jacketed Flat Point will do 1300 feet per second with the same load. For a slightly less powerful load, try 34.0 grains of WW680 with either of the 300 grain bullets. BULLET LOAD MV 10" MV 8" MV 6"